Warm summer nights in the New York are great. Neighborhoods with great bars and restaurants come alive with people looking for a place to chill out and have a good time. So here at Waggit, we thought, why not invite our friends to chill and hang out while raising money for something we really care about: animal rescue. 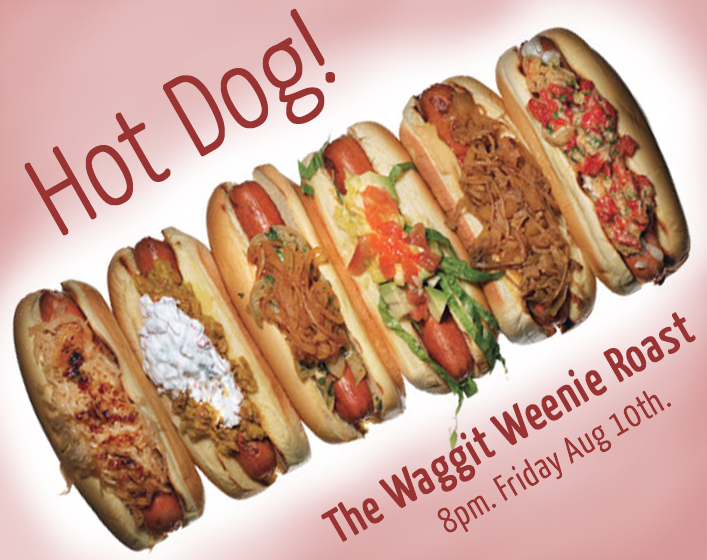 So with a lot of help from our friends and some careful planning, Waggit successfully hosted our very first fundraiser – The Waggit Weenie Roast. Wiener dog jokes aside, over 50 people came out for our modest rooftop party in Long Island City. With the Manhattan skyline as our backdrop, people loaded up grilled hotdogs with toppings like sauteed kimchi, fresh guacamole, bacon and spicy jalapeno peppers. And of course – what hot dog spread would be complete without toppings for the ever popular chili cheese dog? With a healthy supply of chilled drinks and desserts, there was plenty of room to spread out, have a nice conversation and kick back after a long work week. Combining our love for dogs and New York, two movies were screened at the party. Best In Show, an obvious dog lovers film, and You’ve Got Mail, a classic romantic comedy that takes place on the Upper West Side of Manhattan. Riverside Park loves dogs! At the end of the night, close to $700 was raised to support the Badass Brooklyn Animal Rescue (BBAR) organization. For the past year and a half, BBAR has found homes for over 275 dogs that came from rural shelters in southern states like Alabama, Florida, and the Carolinas. By organizing transport, holding adoption events almost every Saturday in Williamsburg, and by being an active support network for owners, BBAR makes it easy to adopt a dog in need of a good home. For more information, check out their website and pay them a visit at their hangout spot on Saturdays at NYCPet Store in Williamsburg (475 Driggs (by N11th). Badass Adoption Event (July 14) from Badass Brooklyn Animal Rescue on Vimeo. Waggit would love to feature other rescue groups in other New York boroughs, so if you’re interested in getting your favorite rescue group a shout out on our blog, please write us at info@waggit.com. We love hearing from our readers! I had the privilege of volunteering at the 2nd Annual Performance for the Animals Benefit last Thursday night. And let me tell you, this was an event that will be heralded as a huge success. Not only did folks have a great time, it promoted a great cause: animal adoption. Planning an event like this take a lot of hard work. Good thing there were volunteers with a lot of positive energy to help out! The benefit raised money for one of New Yorks most beloved shelters – The Animal Haven. 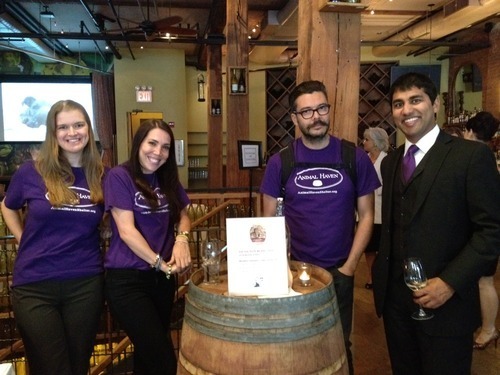 Going classy with wine tasting, horderves and desserts, The City Winery was the place to be for people wanting to promote adoption awareness and have a good time. Edie Falco, well known for her acting in the Sopranos and Nurse Jackie, told the story of how the first day she brought home her adopted Brussels Griffon from the shelter, it threw up on her. A 10 day stay in the Hamptons was auctioned off for $3,100! W00t! Justin Silver, from the CBS show Dogs in the City, showed support by hanging out with guests. There was a screening of a short movie produced by the Animal Haven with interviews of adoption supporters, one of which was John Slattery from the hit TV show Mad Men. Sponge Bob, A 30lb cat was interviewed by Inside Edition. Pretty much everyone looked fabulous. For more pictures, check out our Facebook album. Tiffany Lacey, the Executive Director of the Animal Haven, certainly outdid herself by picking a great venue, forging great partnerships and putting on a wonderful night for all the adoption supporters in New York. The Animal Haven is located in Soho at 251 Centre Street (corner of Broome and Centre St.). After seeing their operations and getting to know the folks that work behind the scenes, I believe this shelter puts the donations to good use and really fulfills their mission of finding homes for abandoned cats and dogs throughout the Tri-State area. The shelter accepts donations through their website. The video from last years benefit. Waggit is a big supporter of animal adoption. By giving New York dog owners a better sense of local community, we hope it makes it easier to adopt an animal that needs a loving home. Badass Brooklyn Adoption – great foster network. Sean Casey Animal Rescue – all kinds of animals rescued here! Mighty Mutts & Ollie’s Place Rescue – hangs out in Union Square on Saturday afternoons so you can meet their dogs that need to be adopted. Anyone support other New York animal adoption organizations that I didn’t mention? Would love to know about them and help spread the adoption love! So how can we help our dogs look better in their photos? Stephanie Madeline, owner of Chase and Snap Photography in New Jersey has 5 helpful tips in making your dog look like a superstar. Even if all you’ve got is a camera phone, show your dog some love and take photos that will make your friend volunteer to dog sit! Bribe – Time to bust out your dogʼs favorite toys and treats to get their attention. Squeaky toys work well most of the time, but be ready to snap quickly because they tend to get bored fast. Get Down & Dirty – Be prepared to roll around on the ﬂoor and get nose to nose with your pet. Photos that are at your petʼs eye level are more engaging than ones taken looking down at the dog. Set the Mood – Lighting is extremely important in getting good photos. Itʼs best to shoot a couple of hours after sunrise and an hour or two before sunset. Mid-day lighting is harsh and unﬂattering so if you must take photos at this time, try to ﬁnd a shady spot under the trees. If indoors, try to ﬁnd the biggest window that lets in the most light. Do not use ﬂash as a lot of dogs donʼt like it and it gives them creepy glowing eyes. Go Trigger Happy – Take LOTS of pictures. During a typical two-hour session, I take over 500 shots on average in order to get about 50 keepers. Memory cards are inexpensive, so go crazy! Have Fun – Donʼt get frustrated if your dog wonʼt sit still for long. They can sense when their human isnʼt happy and it will show in the pictures. Itʼs just a dog being a dog! 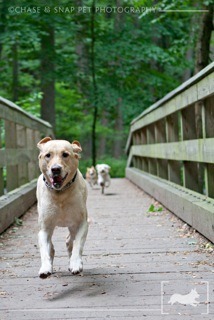 Many people ask me how Iʼm able to get the dogs in my pictures to sit still. My answer is I donʼt. The trick is to get the timing right when they pause for .5 seconds and grab the shot. You can also try getting action shots of your dog running. These are my fav! For those who like to get technical, itʼs best to use a DSLR camera with interchangable lenses and fast shutter speeds are a must when photographing dogs. If using a regular point and shoot, try to set the camera to sports/action mode if it has one. Thanks for the advice Stephanie! We hope these tips go a long ways in improving your photos and makes your dog proud. If you have other tips or tricks, we’d love to hear them. Stephanie Madeline, owner of Chase & Snap Pet Photography is a New Jersey based professional pet photographer who specializes in on location, candid photos of pets in natural light. For more information, please go to www.chaseandsnap.com. New York Dog Walkers – I salute you. Do dogs need winter coats? Sweaters? Look at those baby blues. Ever want a puppy to follow you home?